In many reservoirs common carp fish. The fish hides in a wide, deep areas where there is standing water or poor flow. If the bottom is solid, not rocky, it could be lurking there. Carp prefers weedy ponds with warm water. Catching carp in summer it is necessary in shallow water and when the water is very warm, he's hiding in the creeks. You can find it in the deepest pits, ponds, overgrown with vegetation, and old ducts. The most convenient time for fishing for carp is when he is busy looking for food. Summer from June to August, the carp is kept shallow, about 2 to 5 meters under water and when the water cools down in the fall, the fish descends to a depth of 10 meters, and the beginning of winter in deeper. It is better to catch carp, since may until October, and some reservoirs and up to Nov. Favors for carp fishing cloudy, but warm weather, mild wind blowing from the South-West or South-easterly direction and falling barometric pressure. Also high probability for good fishing in the period 12-24 hours before the weather improves. To catch these fish is during the day. The gentle breeze that covers the water ripples will be of great help to you if you catch a carp in the creeks, quarries, pits, reservoirs. If the wind increased, you should look for carp in the place where the waves lapping on the shore. To catch carp using the following gear: floating bait, srujana rod. Apply sinkers and a float or not depends on where you fish. The day of the float and the sinker should be used, and shruging bait you can fish without them. 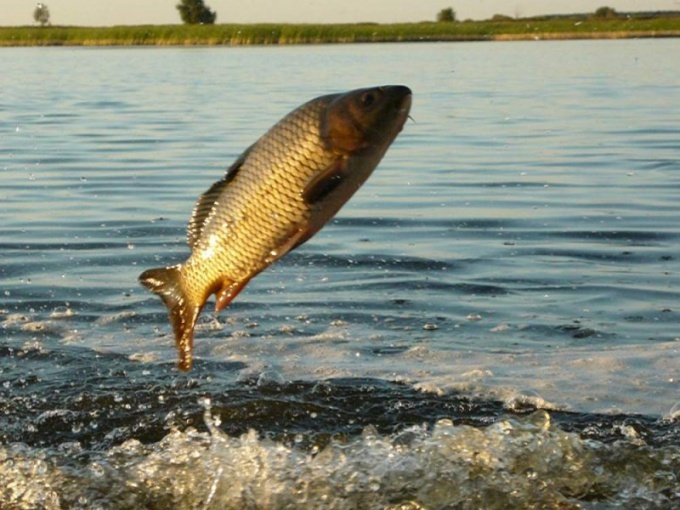 In early summer the carp willing to bite on earthworms, in the middle of summer use, such as potatoes, pasta, bread, corn, peas, legumes. To increase the likelihood of successful fishing, I advise you to bait the carp in certain places. As bait is perfect any grains, boiled potatoes, hemp meal. If you expect to catch in the evening, the bait fall asleep in the morning or the night before. Carp – cautious fish, he is distrustful and extremely changeable in the feeding grounds. The fish can be easily spooked sloppy behavior, loud sounds or inappropriate for carp nozzle. A successful catch ensures you moderate, regular fertilizing. One more thing – feeding, and the bait must always match, otherwise the carp will not take the bait. Very quickly the carp takes the bait, so the carelessness of a fisherman can result in loss not only catch but also equipment. 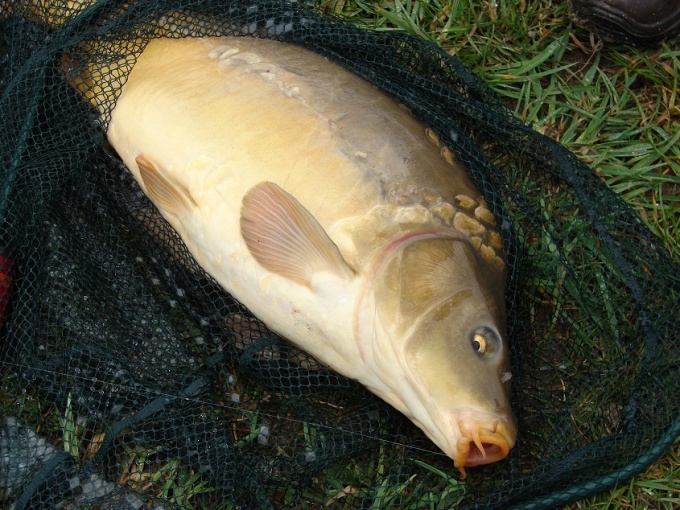 Be sure to take a butterfly net, without which to catch carp is extremely difficult. The intensity of the bite depends on many factors: time of year, water temperature, presence of current, size of nozzle, and even the magnitude of carp. River fish takes the nozzle quickly, and carp that live in the pond quietly, almost imperceptibly. Hungry big fish bite harder. A well-fed carp only slightly touches the float, in some cases, the bite, this fish is very similar to the behavior of the bream. A good catch depends on many factors, among them will not find the proverbial fisherman's luck. Fisherman should know the habits of the fish to come home with a full bucket and count on a hearty soup. Carp aren't biting before the sharp change in the weather. But many fishermen say that the carp and the carp are well caught during a thunderstorm. Of course, for security reasons you should not try to get on the water when thunder rumbles and lightning. During prolonged sweltering heat, when the water temperature gets above +20 ° C, Karp looking fresher. The fish rammed deeper, closer to the cool keys and streams. In very hot weather the carp loses appetite and is sitting in a hole, in the shade of the banks and plants. Feeding carp at a high temperature in the night chill. If a long time is warm, but sometimes a drizzle, the drizzle, the carp and the carp willing to bite. If the temperature drops sharply, the fish can boast a good appetite. Heavy rain, which causes increased flow, flooding, and raises the dregs from the bottom, forcing the carp to hide in quiet pools. This information will help the fisherman to bring a good catch in bad weather. But need to know very well the pond to find the favorite places that the bad weather waits fish. Some fishermen believe that the biting of a carp affected by the phases of the moon. They noticed that the worse the fish takes the bait in the waning moon. There are certain hours for successful carp fishing, at other times the fish will bite badly or you do not see it. The early bite is from dawn to sunrise, the second wave - 6-9 o'clock in the morning and evening bite is 6-9 hours in the afternoon. At the beginning of autumn, when the water is getting cooler, the morning bite lasts up to 11 hours. Carp likes to eat, so to achieve a good bite only with a rich head. Summer offer fish corn, bread, peas, barley, green peas. Well and maggots, earth and dung worm, the thick shelled river mussel and shrimp. Very clever fishermen strung on one hook and ROE, and live bait. It is a kind of canapés for carp. There is special feed for the fish, which are sold in any fishing Department. If the carp aren't biting, then you have not attended to its bait. Experienced fishermen have their own scheme of bait. It consists of the particular place, the exact amount of food and its composition. The nozzle in this case is impregnated with the same flavor, and bait. You can prepare the bait itself from barley, millet, semolina and pea groats. This mess needs to be sticky and very thick, to form out of it balls and throwing them to the place of feeding carp.